How to do split screen on windows 10? Windows 10 has too many amazing features that make your work very easy and productive. Many people do the multitasking on the windows. Splitting our desktop screen makes any kind of multitasking job way easy. 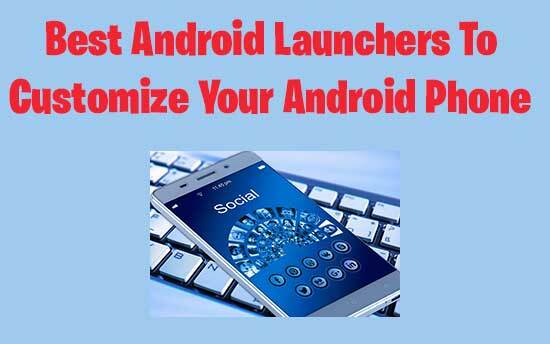 If you are doing any important work on your desktop PC or laptop and you need to use multiple application, then you can split your screen and use multiple applications at the same time. Now you think, to split screen windows 10 we need multiple desktop screen and we have only one screen then how to split screen on windows 10? There are some traditional ways to use multiple apps, like ALT+TAB shortcut or resizing and arranging windows. You can show windows side by side windows 10 desktop screen even if you have a single screen. Windows 10/8/7 has some interesting settings that help you to split multiple application windows in a single screen. Check out following fascinating way and find the solution for how to split screen on windows 10. Tip: – If there are only two apps to screen split windows 10, then select one from them and drag it to the left side of a screen and release the mouse button when you see the flashing of transparent box outline. Do the same thing with another window, drag it to the right side of the screen. Those both apps cover half-half part of the screen and show windows side by side windows 10 desktop. 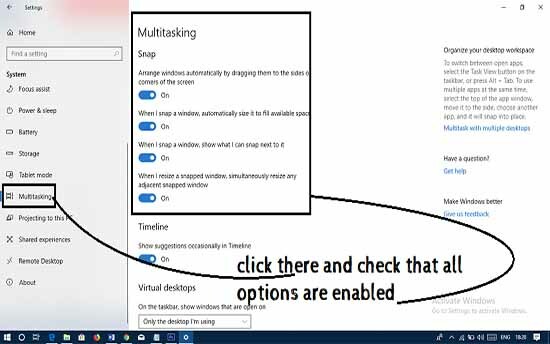 If you are working with only a single window and it is not maximized to the full screen then just drag it to the top of the desktop and release the mouse button, it will be maximized automatically. 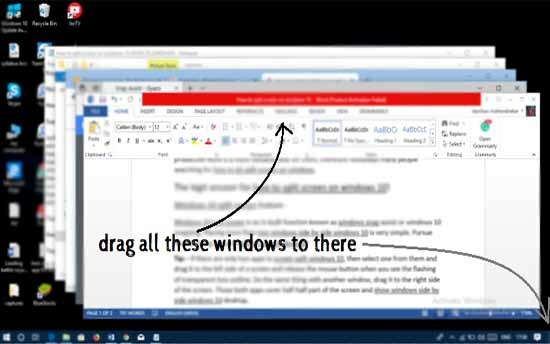 Step 1 – if you have three or more running windows, select and click anyone window app from them and drag it to the right bottom corner of the desktop. You can see that a transparent box quick flashes for fraction of second, then release the mouse button. Similarly, drag all windows to the right bottom corner. 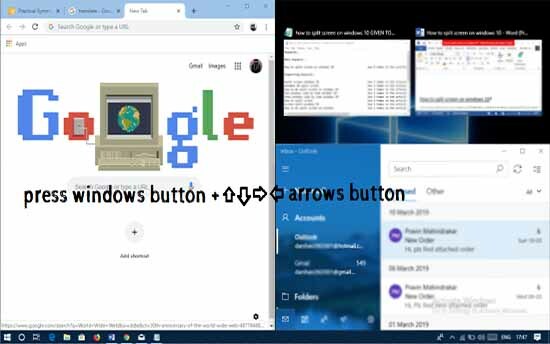 Step 2 – Press windows button + left arrow button, the last dragged windows will automatically get placed on the left half screen. Now arrange all windows as your convenience by using windows button + right/left/up/down arrow button. Tip: – Now you can arrange all those windows in a single screen. After arranging them you can still resize them on the screen by dragging the border of a windows. So, this is only the solution for how to snap screen on windows 10. 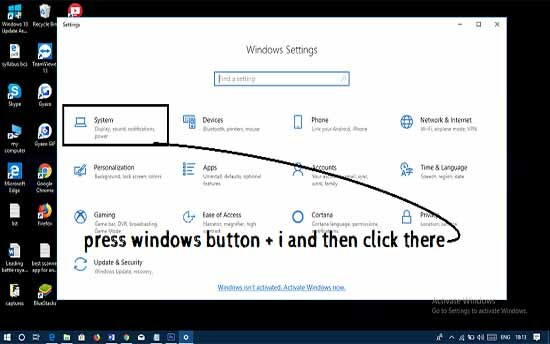 We think there is no need to tell you about to do it vertically or horizontally because you can set windows as you want by using the windows button and arrows. Windows 10 comes with the default enabled settings of the Windows 10 split screen. But in case if your device is not splitting screen well, then you need to check out the setting of snap assist. Follow the below steps to check it. Step 2. Click on the system tab, then click on the multitasking option, enable all the option that you see below the snap headline. Now you know all about how to snap screen on windows 10. If you need another guide about how to split screen in windows 8 or in 7. Then tell us in the comments. We hope you enjoyed this article about how to split screen on windows 10. Stay tuned with us for more similar new updates.